So … it’s Labor Day and the gas grill is busted. What to do? Fire up the hobo grill, of course! My half-barrel burn barrel came in really handy today. 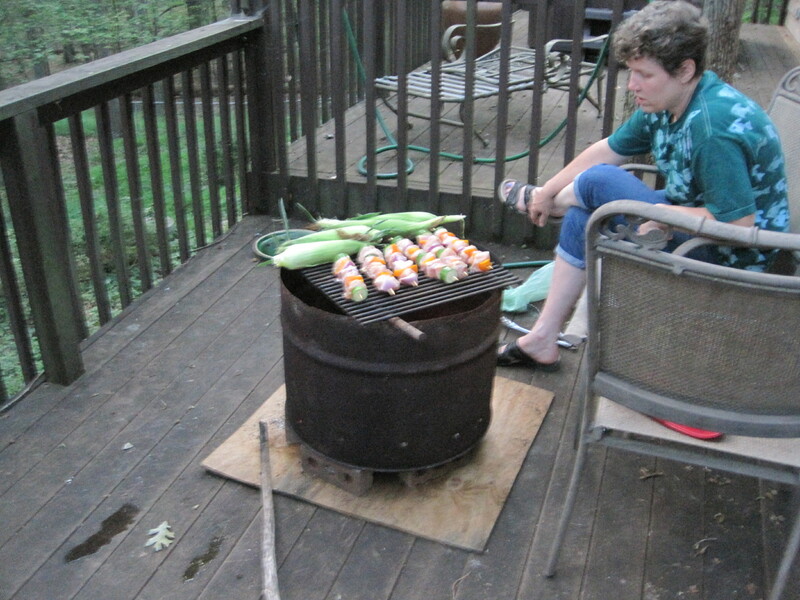 We lit a fire in the barrel and chucked some charcoal on top and grilled our chicken kebabs and sweet corn – old school. This worked so well, that I think we’ll do that again. It takes a while for the fire to burn down, but with a bit of planning – no sweat. And the kebabs are so much tastier! What else? Goats, of course! Friday we bought two goats and one of them was a wedding present for our neighbors on Saturday. The goat was a big hit at the wedding. Nick and Emily really liked the goat, and a bunch of the guests came to check out the goat. Both goats were born in March. The brown one March 10 and the the white one March 18. They are real charmers! 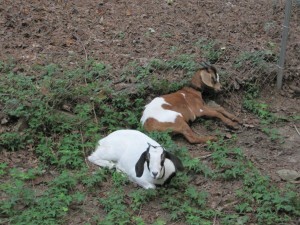 They are both female goats and they grew up together, so they are buddies. We’ll keep them together, too. Eventually, the plan is for them to live together in one of the old horse shelters on the neighbor’s property. One more note … as a Labor Day treat I opened a 7-year-old bottle of beer – Highland’s Imperial Kashmere IPA from 2007. This entry was posted on Monday, September 1st, 2014 at 9:57 pm	and is filed under Celebrate!, North Carolina, Our gang. You can follow any responses to this entry through the RSS 2.0 feed. You can skip to the end and leave a response. Pinging is currently not allowed.